This sequence of video stills, captured by Aleksandr Ivanov in Kamensk-Uralskiy on Feb. 15, shows the breakup of the Chelyabinsk meteor over the course of 2.4 seconds. The 500-kiloton meteor flash that flared over the Russian city of Chelyabinsk in February was bright enough to cause sunburn, and the shock wave was strong enough to knock out cellphone service — but it could have been much worse, scientists say. They say the asteroid that sparked the blast was a broken-up stone that blew apart at a high altitude, littering the area with less debris than would have been expected if it were made of sterner stuff such as solid rock, iron and nickel. The details behind the spectacular Feb. 15 Chelyabinsk meteor explosion are laid out in three studies published by the journals Nature and Science. Among the findings that might give one pause: Debris from the asteroid shows signs that the rock was struck off from a bigger near-Earth object — and other pieces of that object are almost certainly still out there. 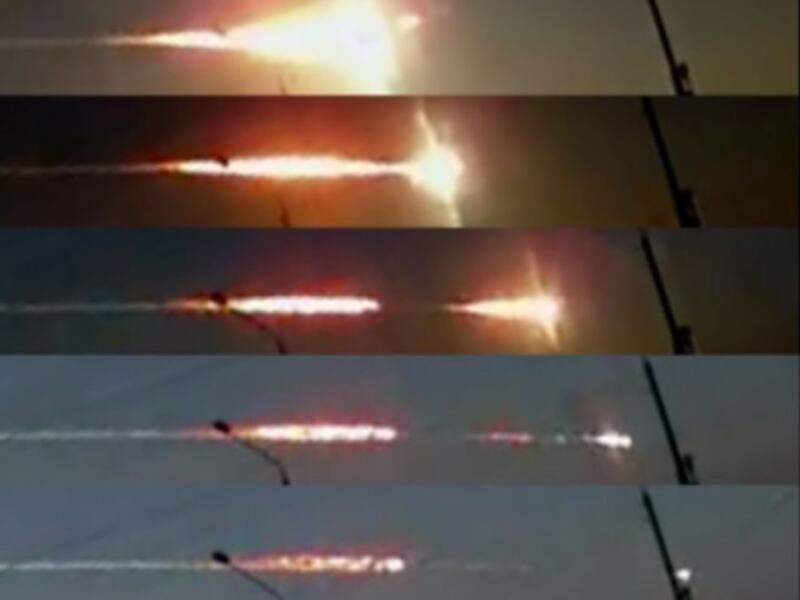 The teams behind the research reconstructed the meteor's path by analyzing amateur videos of the event, documenting patterns of damage on the ground and interviewing witnesses at the scene. "It was a huge amount of work," Western University's Paul Wiegert, one of the astronomers behind the Nature studies, told NBC News. "It involved having people going out to the locations where it was observed, and even measuring the height of street lamps" to gauge the meteor's relative flight path. The findings from two independent teams — relating to the asteroid's size and composition, as well as the energy release and its effects — were consistent with each other and with earlier studies. They agree that the asteroid was about 60 feet (19 meters) wide and broke up at an altitude of roughly 20 miles (30 kilometers), releasing about as much energy as 500 kilotons of TNT. Witnesses heard the buzz of the meteor as it sped past, a phenomenon known as electrophonic sound. 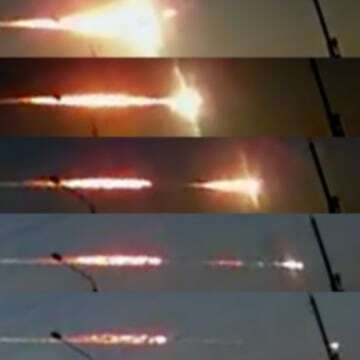 For an instant, the meteor's flash was brighter than the sun, causing mild cases of sunburn and stinging eyes. More than 1,200 injuries were reported in Chelyabinsk, with many of them caused by flying glass. The shock wave from the blast was strong enough to cut off electricity and cellphone connectivity, and trigger the brief shutoff of gas-supply valves in some districts. Several tons' worth of material fell to Earth as debris, the consortium reported. That's well less than a thousandth of the asteroid's initial mass. About 76 percent of the asteroid is thought to have burned up in the atmosphere, and most of the rest ended up as dust. 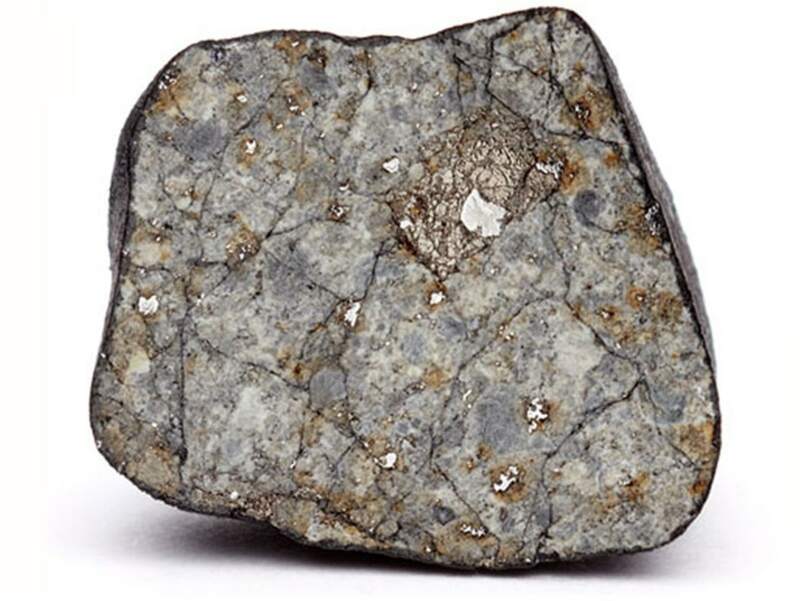 This cross-section of a 1.5-inch (4-centimeter) meteorite from the Chelyabinsk blast shows the shock veins that hold bits of rock together. 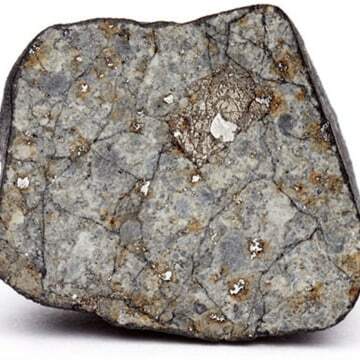 Both teams confirmed that the meteorites represented a rare type of stuck-together space rocks known as LL chondrites. One of the best-known examples of an LL meteorite is the asteroid Itokawa, which was visited and sampled by Japan's Hayabusa probe in 2005. Such asteroids have been compared to loose rubble piles, held together by shock veins of metal. A closer look at the surviving rocks led both teams to conclude that the asteroid behind the Chelyabinsk meteor had broken off from a larger asteroid, perhaps due to collisions with other space debris in the asteroid belt or a gravitational kick delivered during an earlier close encounter with Earth. The researchers behind the Science paper said the asteroid was held together loosely, either due to cracks or a "weakly consolidated rubble pile morphology." But the scientists behind one of the Nature papers said it was "probably a fractured single stone and not a rubble-pile assemblage." That Nature paper noted that the Chelyabinsk rock couldn't have been detected before the blast. "The Chelyabinsk asteroid was simply too small to be seen at large distances from the Earth with current technology," Jiri Borovicka of the Astronomical Institute at the Academy of Sciences of the Czech Republic, told NBC News in an email. "It approached the Earth from the direction of the sun, but even if it came from the opposite direction, there would be high chance that it would have been missed by the current survey telescopes during the few days before the impact when it would be observable." Borovicka and her colleagues suggest that the 1.4-mile-wide (2.2-kilometer-wide) asteroid 1999 NC43 was a bigger piece of the object that spawned the Chelyabinsk asteroid. "1999 NC43 is a potentially hazardous asteroid, so a collision with the Earth in a very distant future cannot be fully excluded," Borovicka said. "But there will be no collision in the next several centuries." Peter Jenniskens, a meteor expert at the SETI Institute and NASA's Ames Research Center, said it was too much of a stretch to link the Russian meteor to 1999 NC43. In the Science paper, Jenniskens and his colleagues say instead that the Chelyabinsk asteroid probably started out in a group of asteroids known as the Flora family. "The story starts with a debris field in the asteroid belt," Jenniskens told NBC News. "Those pieces continued to hit each other." Based on an analysis of February's blast, plus similar airbursts going back to the 1908 Tunguska event, the consortium said the number of asteroids in the Chelyabinsk size range may be underestimated by a factor of seven or so. Astronauts and scientists are currently pressing for a new generation of space-based telescopes that would improve coverage of these potentially deadly skies. Update for 4:50 p.m. ET Nov. 6: Paul Chodas, an asteroid researcher at NASA's Jet Propulsion Laboratory, said that previous estimates set the number of near-Earth asteroids in the Chelyabinsk size range at around 3 million to 4 million. After reading the newly published papers, Chodas told reporters that "the implication is there are seven times more, so on the order of 20 million." The authors of one of the Nature papers provided a similar estimate: They noted that telescopic surveys have detected only 500 near-Earth asteroids in the 10- to 20-meter range (33 to 66 feet wide), out of a total estimated population of 20 million. In addition to Borovicka and Wiegert, the authors of the Nature paper titled "The Trajectory, Structure and Origin of the Chelyabinsk Asteroidal Impactor" include Pavel Spurny, Peter Brown, Pavel Kalenda, David Clark and Lukas Shrbeny. Borovicka, Brown and Spurny are also among the 33 co-authors of the Nature paper titled "A 500-kiloton Airburst Over Chelyabinsk and an Enhanced Hazard From Small Impactors." The principal author of the Science paper, "Chelyabinsk Airburst, Damage Assessment, Meteorite Recovery, and Characterization," is Olga Popova of the Russian Academy of Sciences. Popova and Jenniskens are among the 59 co-authors listed with the Chelyabinsk Airburst Consortium.